Published by Harper Collins in 2017. Photo Credit: Fair Use. Not only does Smith create a sense of a world which is so rich and compelling that you want to stay within it, but he also creates a character who stands up as one of the best I’ve read in years. 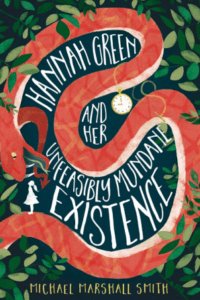 Hannah Green is ordinary. Her life — at least her usual life — is indeed unfeasibly mundane. But this girl is capable of extraordinary things. Throughout the book, we see Hannah experiencing conflicts and emotions that are very normal for an eleven-year-old and yet rarely written about with such realistic focus. She is confused about her feelings, angry with the people she loves and bored of being treated like a kid. This goes hand in hand with her approach to the supernatural. The Devil, from her perspective, is really quite an annoying person, whose foremost redeeming quality is that he, for one, does not treat her like a kid. In fact, he recognises her ability to accept the reality of whatever she sees before her and expects her to take on risks and responsibilities in order to save the world — or, rather, the Hell. Hannah manages brilliantly. She explores the dark sides of the world, the monsters lurking in her habitual haunts and the hell that can come inside your mind. Slowly, she begins to explore her own personal demons — not the silly, mushroom-like creature plodding helpfully at her side, but the absence of her mother, disappeared for reasons Hannah knows she can only partially grasp. Divorce is a difficult issue for many children; when a parent walks away from the family life you have known, it is hard to accept that they have not left you. There is a unique pain on one page of this book, when Smith has the courage to let Hannah say she ‘hates’ someone and leave it unresolved, lingering over his characters like certain awful conversations stay with us in real life. Ultimately, you will finish this book with a renewed conviction that girls, however young, can deal with both world-changing adventure and painful, personal domestic change. You can find Hannah at most major booksellers and hopefully some libraries; I really recommend you do!